Nuts and legumes are part of everyday food that contain a lot of nutrients needed for the body. It is difficult to distinguish between nuts and legumes as they are identical in many respects. Both the nuts and legumes come with a dry fruit inside a pod but when closely examined nuts and legumes are different. One of the main differences that can be noted between nuts and legumes is in the number of seeds present inside the shell. Nuts usually come with one or two seeds. On the other hand, legumes come with multiple seeds. While legumes are dehiscent (bursting open on their own naturally), nuts usually are not and they have to be cracked open. While the seeds of a nut are not attached to the walls of the pod, the seeds of legume are attached to the walls of the shell. When talking of the nutritional aspects, the legumes are dense food. Legumes contain about 18 to 25 per cent of proteins and are a good source of dietary fiber. They are also low in fat content. The legumes are also rich in vitamin B complex and minerals like Potassium, Calcium and Magnesium. They are also a great source of phytosterols. The nuts also have almost the same protein content as that of the legumes. The nuts are high in fats but contain low saturated fats. The Nuts are a good source of Potassium, Magnesium and copper. Another difference that can be noticed is in the cost. Legumes are a bit more costly than the nuts. Some of the common nuts include macadamia nuts, brazil nuts, cashews, hazels, almonds, pecans, pistachios, pine nuts and walnuts . The common legumes include black-eyed peas, black beans, garbanzo beans, navy beans, pinto beans , kidney beans and lentils. 1. A nut usually comes with one or two seeds. On the other hand, a legume comes with mulitple seeds. 2. While the seeds of a nut are not attached to the walls of the pod, the seeds of legume are attached to the walls of the shell. 5. When compared to nuts, the legumes are a bit more costly. Prabhat S. "Difference Between Nuts and Legumes." DifferenceBetween.net. 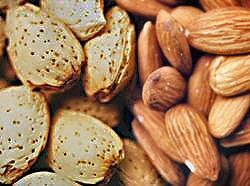 December 23, 2012 < http://www.differencebetween.net/object/comparisons-of-food-items/difference-between-nuts-and-legumes/ >. Get the facts, please. This article does a terrible disservice to people who are deathly allergic to legumes. Peanuts, limas, lentils, and peas are all legumes. Black beans, pintos, and kidney beans are just beans – not legumes, not nuts. Badly researched. Peanuts are legumes, not nuts. Coconuts and almonds are also technically not nuts despite you using them as examples of just that. The comment about cost is also totally inaccurate in the majority of cases. The peanut is actually a legume, not a nut at all. I have psoriasis and have worked out over the years that legumes and nuts make it worse what common ingredient do all of these have? Phyto-acids. Legumes and Nuts contain a high amount of these acids which some try to soak out but unless they do a fermentation soak, the Phyto-acids stay. In addition to allergens, they bind strongly to calcium, iron and zinc which can prevent absorption. The seed legumes like peanuts are rich with phyto-acids. The odd thing is, other members of the Leguminosae family, like black beans, kidney beans and pinto beans, also have phyto-acids which is probably why some soak the beans before cooking. Again, unless a pickling or fermenting agent is used to soak them, there is no significant effect. I’ve soaked mine in ginger-ale as an experiment on several occasions and some say they seem to have an easier time digesting the beans I make. The thing is, when it is just for me and my family, I don’t pre-soak them. I don’t observe any difference. Regarding the comment on “cost”…where can I find macadamia nuts & pine nuts cheaper than beans, peas & peanuts?? Really inaccurate on that point. I am really confused with all the replys. Pls, can any anyone suggest me what should I eat if I have constant reoccurence of kidney stones and have uric acid too. I also had a kidney stone problem. The best is lots of orange juice, lemon water, and stay hydrated. Avoid soft cheese, nuts in quantity and tea in quantity.